Post and rail fencing can make for an attractive perimeter fence in a domestic environment. The open style of the fence causes minimal disruption to views, yet still provides a secure fence that is popular for keeping pets in and small animals out. There are also options to have heavy duty wire for livestock as well as dug in rabbit wire to protect the lawn areas. 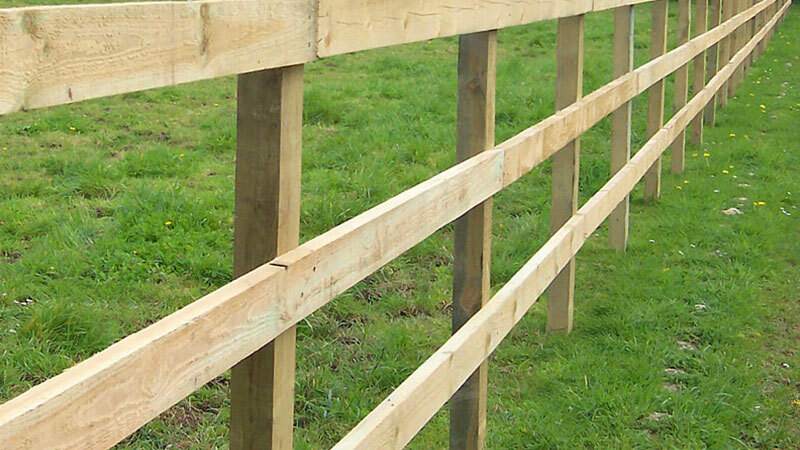 Fence posts are concreted in at 1.8m centres, and the treated wood materials allow for gently curving fences as well as various angles and gradient of land. View our Commercial work and contact us for a quote. We cover all areas within a 40 mile radius of Aylesbury, but please call us if you live outside this radius as we may be able to help. We specialise in supplying and installing commercial and domestic fencing and landscaping. We also undertake domestic repairs. We are fully insured and trained to complete each job to the highest possible standard. With over 30 years of combined experience, we endeavour to undertake each project with care and precision. We leave your site as tidy as we can each day and respect your day to day living whilst on your property. We will answer any questions or concerns you may have about each job, so get in touch now for a free quote.